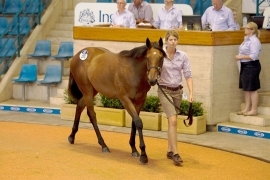 Buyers have thrown their support behind the split format of the 2013 Inglis Sydney Classic Yearling Sale outlaying $5,678,500 on 173 lots during the inaugural session of the Summer Book at Newmarket on Sunday. “Our aim in trimming the Classic offerings in January to a two day Summer Book has been to reduce the pressure on both buyers and vendors, who are faced with very busy schedules at the start of the year, which has led to pleasing feedback and results,” said Inglis Bloodstock Director Jonathan D’Arcy. The average price on Day One was up on last year’s figure to $32,824, with the median also rising considerably to $30,000. “Our bloodstock staff were very mindful of selecting precocious physical types for the Summer Book and we have no doubt there will be plenty of top racehorses to come from today and tomorrow’s offerings,” D’Arcy added. The Classic Sale is the source of no less than seven individual Group 1 winners in the last two years; Fiveandahalfstar, Sincero, Manawanui , Secret Admirer, Ilovethiscity, Hurtle Myrtle & The Verminator. A close relation to The Verminator was sold as Lot 112 to top Perth trainer Simon Miller for $80,000 today, one of 12 lots to sell for $70,000 or more. The two top prices recorded on Sunday were for fillies by Arrowfield Stud’s red hot sire Snitzel. Arrowfield were the vendor of Lot 225 (pictured) from Deputy Lil which was sold to Kitchwin Hills for $135,000. BK Breeding & Racing paid $120,000 for Widden Stud’s filly by Snitzel from Can’t Hackit, which was offered as Lot 167. Widden Stud has a fantastic record of selling top level gallopers from Classic such as Whobegotyou, Triple Honour, Typhoon Zed and Budriguez. The Widden Valley operation finished as the leading vendor by aggregate today, selling 20 for $560,500. A buyer who has had plenty of success buying from Classic has been Anthony Cummings, who purchased $457,600 earner Diamond Earth from the 2011 sale for $60,000. Cummings had his eye fixed on another speedy looking daughter of Choisir during today’s session and duly snapped her up for $75,000, being Goodwood Farm’s filly from She’s In The Guide (Lot 18). Local trainers had plenty of competition from interstate and overseas throughout the day with 11 yearlings heading to New Zealand, 6 to Korea, 36 to Victoria, 11 to Queensland, 8 to Western Australia, 8 to South Australia and 3 to the ACT. “There are 234 yearlings catalogued to be offered tomorrow, including more precocious physical types that Classic is renowned for”, D’Arcy points out. Horses passed in during today’s session are available for sale via the Inglis Make-An-Offer Service. The Classic Sale continues from 11am tomorrow, with Sale Day Live and Online Bidding again available for those not able to make it to Newmarket.